If you’re in a business that sells to other businesses, you know how difficult it can be. Whether you’re a small business or a global enterprise, the daily challenges of communicating can add up to quarterly headaches and annual recalibrations. But if you’re marketing as actively as you need to, then some simple rules can help. For much of my career, I’ve been involved with businesses that need to convince other businesses to engage. From media companies to industrial businesses to distributors and exhibitors, I’ve seen the challenges of articulating compelling messages that resonate and drive response. B-to-b marketing is indeed a unique discipline, and it has rules that its consumer counterpart cannot even imagine having to navigate. However, that doesn’t mean that it has to be cold, or impersonal or the mother of all sins: boring. A fair amount of b-to-b advertising approaches will highlight some random case study about Bob, of Company Y, who increased productivity 400% while using Solution X. No call to action, no contact name, no direct connection. Now, in fairness, not all b-to-b advertising has to be direct response, but it should have an articulated point of view, and should clearly define what the value proposition is through some means. It should sell in whatever way works best for your brand and in whatever way makes it easiest for your prospect. DON’T run a competitive ad unless you can back it up with verified third party data. Your opinion of your competition means nothing unless there’s a tangible difference to your prospect. It’s okay to establish a clear difference between your brand and competitive offerings – but if you’re just beating your chest over a nominal difference in features, you’ll coming out looking mean. And nobody wants to do business with a meanie. Someone I admire very much constantly reminds me of the phrase “don’t ask, don’t get.” While I’ve just said that all b-to-b advertising doesn’t have to be direct response, the best business conversations do include an appeal to interact. So propose a demo. Ask for the call. Heck, ask for the business! But do it in a way that makes the prospect’s life/business/daily challenges easier, and then ensure that at the end of the road, things get even brighter! Remember the important lesson that hope is not a strategy for success. Regardless of the “professional” nature of b-to-b, every buying decision – whether it’s technology, or information or industrial steel – is an emotional process. The CEO, or the CTO or the procurement manager of a municipality still has to “feel” good about your offering, your pricing, your service guarantee. Don’t abandon this core principle. It could mean the difference between getting a response or not. Advertising, in my opinion, is one of the most powerful forces in global business. We have the opportunity to persuade and entertain using interrelated words and pictures. Many executives agonize over the words, (because we all have opinions, whether or not we can articulate them,) but leave the pictures to an afterthought (because not everyone is a visual thinker or an artist.) When you can be visually arresting (in print or moving pictures,) you can elevate the corresponding language to a level that the words alone could not have achieved. Sure, use a chart or a graph to visually demonstrate, but make sure it’s designed to delight as much as it is to inform. As mentioned above, it’s important to talk to a PERSON. Unfortunately, a lot of b-to-b advertising tries to sell to the whole organization, or a department or an executive team. But the only way to do that is to use generic, bland, SAFE language. I’ll remind you that generic, bland and safe do not compelling advertising make. Be excited! Be visual. Dramatize the benefit. Claim the highest possible ground for your brand and then differentiate the snot out of it. Get out of techno-speak for techno-speak’s sake…start using hard-hitting language that proves you understand the prospect’s challenges, proves your product or service can meet and exceed those challenges, and proves that choosing you will make that singular prospect feel empowered, excited and engaged. I’ve been loitering in the VC galaxy lately, and it’s a funky neighborhood. Private equity firms and their representatives are very active, especially in the technology space, looking for the next this or that, and betting millions on “neato” ideas. And while figuring out which companies might get a shot at glory is a little bit like deconstructing Scientology, the real work begins after funding. As it relates to marketing, startups (pre-money or post,) have challenges that established brands don’t. A startup brand has to do more explaining, more demonstrating, more proving their worth – they’re fighting for a reliable spot in the minds of consumers. And that’s in addition to duking it out and swiping some share from all the competitors out there, who are themselves both enjoying and defending their established positions. If you put your matchmaking hat on for just a moment, you see that these traits match up almost perfectly with a small (or smaller) agency. Generally speaking, smaller agencies can produce appreciable results, quickly, and for less initial investment. There are a number of reasons for this (and this is NOT a bash piece on larger agencies – they have their place, and we’ll get to that in a moment,) not the least of which is scale. With less overhead and heft, smaller agencies can generate results for startups for less overall dollars. Smaller agencies have a gift for seeing numerous finish lines that are attainable and help to motivate the internal staff. 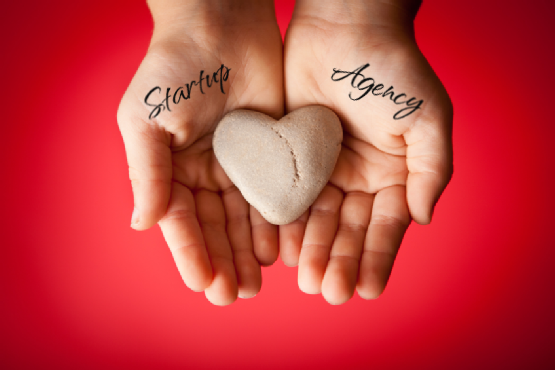 For instance, a smaller agency might recommend a social media program for the startup. And then it becomes a race to 10,000 likes. Or 1,000 followers. Or whatever. These are simple, digestible goals for both the agency and the client…and it looks like progress. With larger agencies, success like this is just a daily occurrence, and it may have lost its luster. Smaller agencies are also more likely to look for “under the radar” strategies. And as it relates to the need to last, smaller agencies will typically put more legwork in setting up strategic partnerships (like distribution or sell-in) with other entrepreneurs in their small agency network. In contrast, larger agencies see success in TRPs, and typically recommend advertising first, everything else after. Smaller agencies are also easier to fire, since the financial risk of their involvement is limited. And that’s actually an advantage to the startup. With less overall exposure, they’re not tied to overly long-term plans. So if things aren’t going well after year 1, they may consider a reboot, either with another small agency, or perhaps a slightly larger marketing enterprise, if things are beginning to move. It all depends on the objectives for the startup and their investment team. If things are indeed progressing according to plan, a smaller agency may NOT be the partner to help that company expand globally, or to establish more high-profile partnerships. In that case, it may be time to pass the ball. And although smaller agencies match up with startup needs and their financial limitations, larger agencies do have more reach and more bodies to execute on multiple planes at once. For instance, if the play is to execute a truly integrated marketing outreach, a large agency can put experts on every channel in about a day and roll out the integrated plan next Tuesday across social, mobile, web, TV, radio, outdoor and even a cool experiential thing at a trade show next week. The little guys simply don’t have that kind of muscle. In addition, larger agencies have advantages that smaller agencies cannot even comprehend. While a smaller agency might be able to do more with less, larger agencies have the ability to do EVEN more with more. Take media buying, for instance. If a small agency is buying spot cable for a limited budget, they’re going to get only so far. Mr. Big agency comes along and requests the same buy, and then smoothly reminds the station that they also buy tens of millions across the network, and they’re likely to get more points/exposure or better slots for the same outlay. It’s simply the law of scale and leverage. Those advantages aside, however, small agencies and startups are clearly a match with big upside possibility – from the business side straight on through to intangibles, like personality, vibe, etc. But it’s mostly because, in the best cases, the two companies help each other grow into their fullest potential.